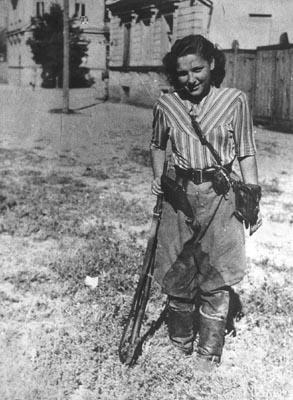 Holocaust Survivors: Photo Gallery - "Partisan Rachel Rudnitzky After Liberation"
Rachel Sacher Rudnitzky in Vilna after the liberation of the city by the Red Army on July 14, 1944. Rudnitzky was a Jewish partisan who fought in the Rudniki forest near Vilna. She was the daughter of a cantor from Warsaw and the sister of Yitzhak Arad (formerly Rudnitzky) the former director of Yad Vashem Holocaust Museum in Jerusalem. Photo Credit: Jewish State Museum of Lithuania, Yivo Institute of Jewish Research, courtesy USHMM.